Edgar has lots of opinion when I am mucking the donkey pen. He runs to greet me- which usually results in him blocking the gate I am trying to get through. That takes some un-tangling. Once I am in, he carefully positions himself over top of a muck pile, between me and the muck cart, in perfect position to make it impossible to actually get a fork-full to the cart. Then he refuses to move- my shushing and flailing fall on long and deaf ears. Edgar doesn’t budge. But he is patient with lower life forms; he waits until I get my rude and unfocused self together and put down my fork. You might think he wants something, but this isn’t about taking. Edgar has something to give me, and he needs me to pay attention. He is elegant in his simplicity, eloquent without words; he just wants a still moment to let me know that he is grateful. Sometimes Edgar gives me a lean, sometimes a nuzzle. There is a shared breath, it just takes a moment, and I am reminded that poop isn’t the most important thing. Thanks-giving involves thanks-taking as well. Then Edgar allows me to finish mucking, always lurking close at my heels. Others are waiting; mucking is a chore to be savored for the company if not the actual task. Living in a herd and being the minority species is a constant education for me. 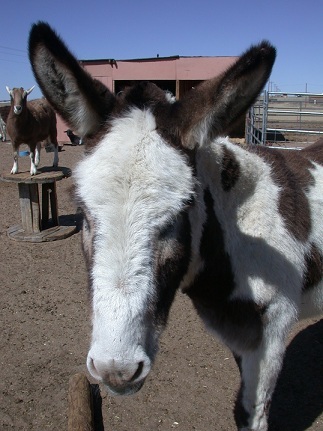 Donkeys (or horses or any other animal) aren’t a career, or a hobby, or a passion. Our investment in time and money is great, but they aren’t a possession. First, foremost they are each a life, whole and true. We need to acknowledge and respect that they exist in full dimension, with conscious intelligence. We limit animals by humanizing them. They live in a larger, natural world that expands past our individual human hill-of-beans lives. A shared acknowledgement with animals is an affirmation of sharing that greater Life. Edgar knows that and the more I listen, the more I learn. My own well being is enriched by it. ← Babysitter in the Barn. Very Wordsworth: “Our birth is just a sleep and a forgetting . . . trailing clouds of glory do we come” . Animals and children, they both make you focus on the simple things of life.